Gravity, 12 Years A Slave and American Hustle were the big winners at last night’s BAFTAs. While many were questioning the British connections to Gravity (winner of the Best British film), the biggest controversy of the night was the omission of James Gandolfini in the In Memoriam segment. Controversy aside, Stephen Fry again shone as the night’s host, showing other awards’ hosts how to host an ceremony by being likeable, witty and fast (although to be fair, the BAFTAs are screened a couple of hours after the actual ceremony has begun so there is some editing – namely, cutting out a few of the winners). Talking about winners, the standout speeches for me were from Cate Blanchett, Helen Mirren, Steve McQueen and Barkhad Abdi. Barkhad Abdi’s win for Best Supporting Actor (Captain Phillips) is one that movies are made of. Abdi had never acted before Paul Greengrass picked him for this role (in his acceptance speech he thanked Greengrass for “believing in me before I believed in myself”). 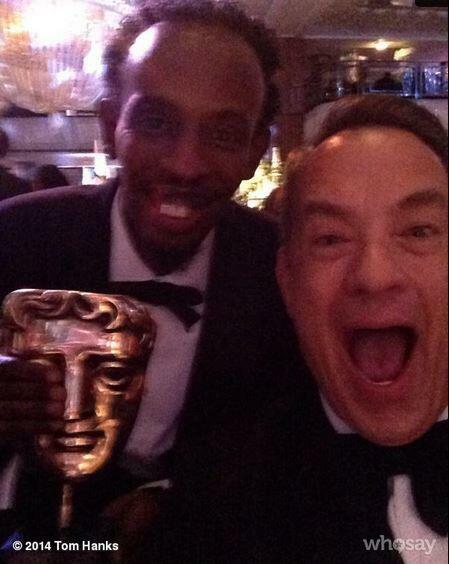 Abdi wasn’t the only one thrilled with his win so was most of the audience – but especially his co-star Tom Hanks. He cheered and wolf whistles as Abdi took to the stage to accept his award. Tom tweeted after the ceremony “Barkhad Abdi! BAFTA winner! He IS the captain now ! Somali champion !!! Hanx.”, along with this photo below. This entry was posted in Movie News and tagged 12 Years A Slave, BAFTAS 2014, Barkhad Abdi, Captain Phillips, Cate Blanchett, Gravity, Helen Mirren, Sarina Bellissimo, Stephen Fry, Steve McQueen, The Bellissimo Files, Tom Hanks. Bookmark the permalink.